BILLINGS, Mont. – The PBR’s toughest cowboy might be a 12-year-old girl. Mini bull rider Najiah Knight is quickly making a name for herself, not just as a trailblazer in the traditionally male-dominated sport of bull riding, but as an athlete in her own right. On Friday night during Round 1 of the Billings Invitational, presented by Cooper Tires, in Billings, Montana, Knight took part in the Mini Bull Riders competition during intermission. She bucked off and got hung up, falling hard. The crowd hushed as she was tended to. “I felt myself going off to the side, and I couldn’t throw myself back over, so then he stepped on my leg,” Knight said. But it was only a few seconds before she was back up, waving gamely to the crowd as she was carried from the dirt by none other than eight-time Stock Contractor of the Year Chad Berger. Early the next morning, Knight was sporting a deep purple bruise under her chin and limping slightly. But like any cowboy worth their salt, she was toughing it out and back at work. This time, however, her work was a sponsor photo shoot. Hair curled, tinted Chapstick applied and adorned with sparkling silver jewelry, she was instructed on how to pose for the camera, alternately smiling and serving her best game face. “She’s much more comfortable covered in dirt,” her mother, Missy, quipped, looking on as the cameras flashed. Though she does have dance experience – Missy says Najiah’s dance training is what helped her effortlessly switch between happy and serious faces at the photo shoot – Knight tends to stick to more rough-and-tumble sports. Basketball is her favorite – she plays point guard, naturally – and she hopes to one day play for the University of Oregon. But first and foremost, she’s a cowboy and, like any other, hopes to one day make it in the PBR. “Girls can do anything and everything,” she said. When Missy got married, Najiah was a bridesmaid, and her mother is still incredulous at her stubborn insistence in sticking to her cowboy ways. “She wore her hat and boots with her dress,” Missy said, pulling up a photo of her bridal party. In the group of women wearing teal dresses, Najiah stands on the far right end, smiling brightly under her trademark cowboy hat. On Saturday night, just hours after posing for photos in her best cowboy glam, Knight was back in her element and being treated no differently than the boys on the back of a mini bull. 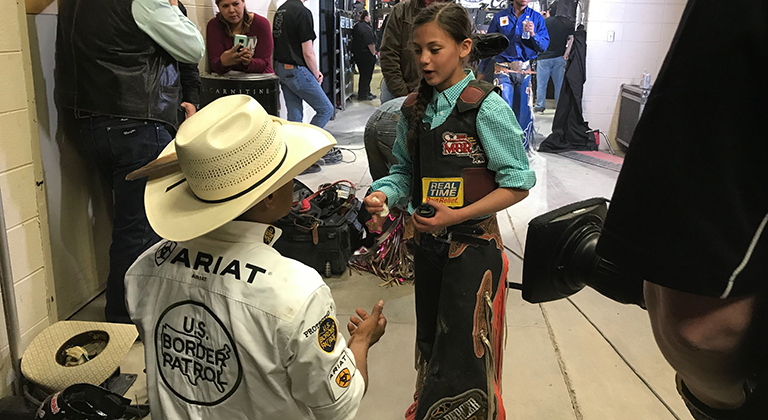 She had one more out in Rimrock Auto Arena, after which she retreated to the tunnel and was met by 2018 Rookie of the Year Keyshawn Whitehorse. Knight, who looks up to fellow Native riders Whitehorse, Stetson Lawrence and Ryan Dirteater, spent a few minutes listening intently as Whitehorse crouched in front of her and offered advice, gesturing emphatically. When he was finished, he stood and wrapped her in a brief hug. It wasn’t long before Knight was approached by veteran bullfighter Frank Newsom, who had his own words of advice and encouragement. 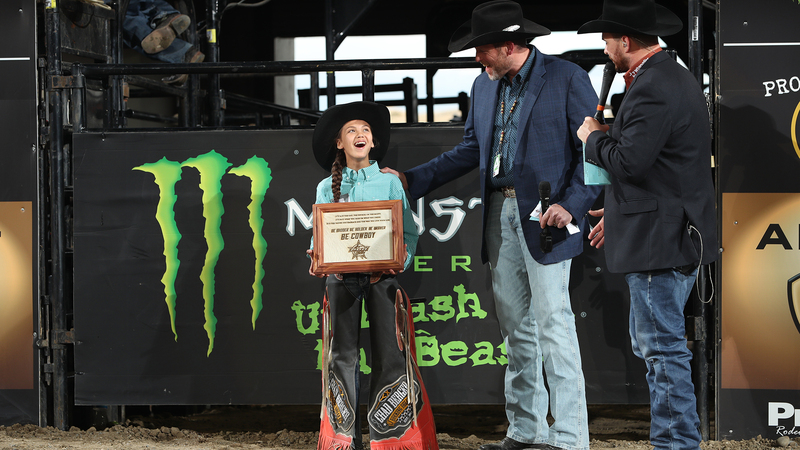 Earlier in the evening, Knight was honored for her toughness by PBR CEO Sean Gleason as the Be Cowboy honoree of the weekend. At each Unleash The Beast event, the Be Cowboy campaign honors one cowboy who embodies the cowboy code of toughness, courage, respect, determination, truth, gratitude and patriotism. Just days after the Montana state legislature voted against recognizing the International Day of the Cowboy because of complaints the day doesn’t honor cowgirls, Gleason took great pride in recognizing a female cowboy making a name for herself in the PBR.